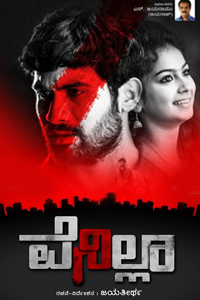 Title = Nishyabda 2, Producer – Tharanath Bolar, Direction – Devaraj Kumar, Music – Satish Aryan, Cinematography – Veenus Murthy, Cast – Avinash, Roopesh Shetty, Aradhya Shetty, Petrol Prasanna, a Dog and others. Director Devaraj Kumar had altered his first half of ‘Nishyabda 2’ with some portions to create curiosity he would have got wide appreciation. Unfortunately his first half is not gripping but added entire grip in the second half of ‘Nishyabda 2’. The second half is like a fully loaded pistol. In fact there is lot of work for pistol in the hands of blind military officer who is living in unique style in life. The target for trio – Roopesh, Aradhya and Prasanna is this high tech house to grab Rs.5 crores. It is not an ordinary task and requires good homework for the trio. There is a very strong and furious dog living with blind officer. Getting inside the house is toughest as everything is systematized. As money is required for trio for different purpose they reach the spot with some preparation. A dog is silenced for half an hour, the blind military officer Avinash is stopped getting out from his room with a smoke. It is just half an hour time the trio should trace the locker for nab Rs.5 crores. The thrill starts when very efficient military officer who is blind gets out of his room. The first of the three Prasanna is killed by major and he search for two others after he knows from the shoes placed at a spot. The brutal attack starts and blind man travelling all around his house gives a difficult time. There is a counter attack too. The entire house goes pitch dark as blind man shuts power supply. The situation becomes even more dangerous. There is one more character in the house facing punishment from blind major. What next situation creates lot of excitement! You have to watch further proceedings inside the cinema halls. Avinash agile actor of Kannada filmdom has taken a tough challenge in giving a blind retired military officer role. He has done a fantastic job. A dog to his company is further more furious. Roopesh Shetty and Aradhya Shetty make a good pair. Petrol Prasanna has different role compared to his previous villain roles. This is just 111 minutes cinema with superb second half narration. The background score, cinematography is well designed to keep up the heat for the film in the second half. Devaraj Kumar has given a deadly second half that is chilling and thrilling.